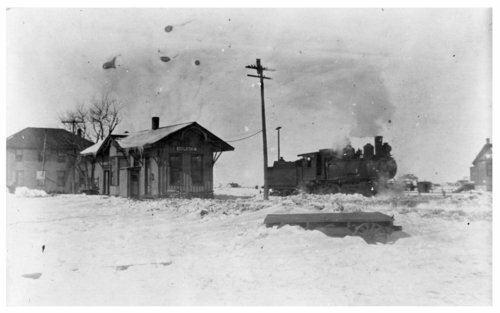 These four photographs show the Missouri Pacific Railroad depot in Horace, Kansas. One is a shot of the depot with a steam locomotive and snow on the ground. Three of the images show the same deport (first?) and one shows a more recent depot. The image with the white depot shows elevators for Woods Feeds in the background.